Chile has created five sprawling national parks to preserve vast tracts of Patagonia – the culmination of more than two decades of land acquisition by the US philanthropists Doug Tompkins and Kristine McDivitt Tompkins and the largest donation of private land to government in South America. The five parks, spanning 10.3m acres, were signed into law on Monday by Chile’s president Michelle Bachelet, launching a new 17-park route that stretches down the southern spine of Chile to Cape Horn. McDivitt Tompkins, the former chief executive of the outdoors company Patagonia, handed over 1m acres to help create the new parks. The Chilean government provided the rest in federally controlled land. McDivitt Tompkins has spent 25 years working on land conservation in Chile with her late husband Doug, who founded North Face and Esprit. Doug Tompkins died in a kayaking accident in Chile in 2015. 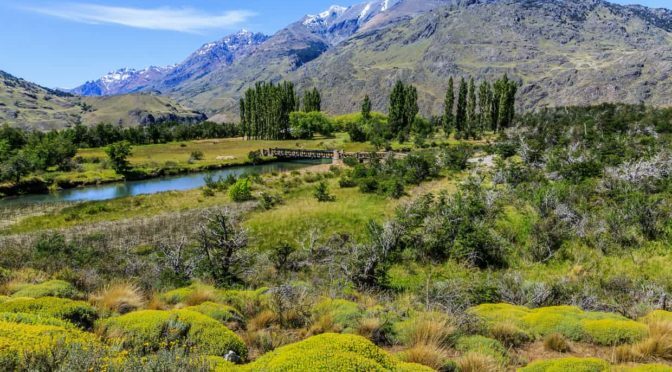 The creation of the parks marks the latest in a flurry of environmental protection laws which have brought Chile to the forefront of worldwide conservation efforts. Last month, Bachelet – who leaves office in March – completed a five-year negotiation with residents of Easter Island to form one of the world’s largest Marine Protected areas, which will protect some 720,000 sq km of the Pacific Ocean. “President Bachelet is leaving behind a bold legacy of environmental protection,” said Maximiliano Bello, an advisor to the Pew Bertarelli Ocean Legacy program. After moving to Chile from California in the early 1990s, the Tompkinses spent hundreds of millions of dollars to purchase and “rewild” swaths of land. The approach hasn’t been without controversy: some locals bristled at what they considered a clumsy American land grab. Loggers and ranchers complained that valuable land was taken, and the couple were also criticized for successfully agitating to prevent a huge hydroelectric scheme. Relations have improved in recent years, with the handover of hundreds of thousands of acres to the Chilean national park service. McDivitt Tompkins has touted the ecotourism potential of a region of stunning beauty, with glaciated fjords, roaring rivers, snow-capped mountains and coastal volcanoes. In the windswept Valle Chacabuco, the couple transformed a rundown sheep ranch into the world-class Parque Patagonia. First, they removed an estimated 25,000 sheep, then removed 240 miles of fencing and retrained former ranch workers as conservation workers. Argentine’s centre-right president Mauricio Macri has praised the Tompkins model of conservation, which preserves wild land while bringing in tourists and related business to try to promote sustainable local development. In December 2015, Macri accepted a donation of approximately 370,000 acres from the Conservation Land Trust and McDivitt Tompkins, and announced his support for the planned Iberá national park, a 1.7 million-acre wetland that is home to hundreds of bird species, giant anteaters and wild macaw parrots and includes a breeding program to re-introduce jaguars. But opposition to conservation efforts remains strong in Chile’s controversial farmed salmon industry, which has been fighting efforts for greater regulation. Last year, local ranchers briefly occupied one of the Tompkins’ parks in protest against what they see as the removal of productive lands from the local economy. President Bachelet’s conservation measures are one part of her progressive legacy that is likely to survive the country’s looming change of government. Incoming president Sebastian Piñera – a billionaire businessman supported by an extreme rightwing coalition – has indicated his intention to reverse efforts to loosen the country’s draconian abortion laws and provide free university education to more students, but he is a keen supporter of the Tompkins conservation model. In 2004, Piñera purchased an estimated 250,000 acres of wild lands on the Chilean island of Chiloe, which he converted into Parque Tantauco – inspired, he said, by the Tompkins example.